The SWEET proteins are a group of sugar transporters that play a role in sugar efflux during a range of biological processes, including stress responses. 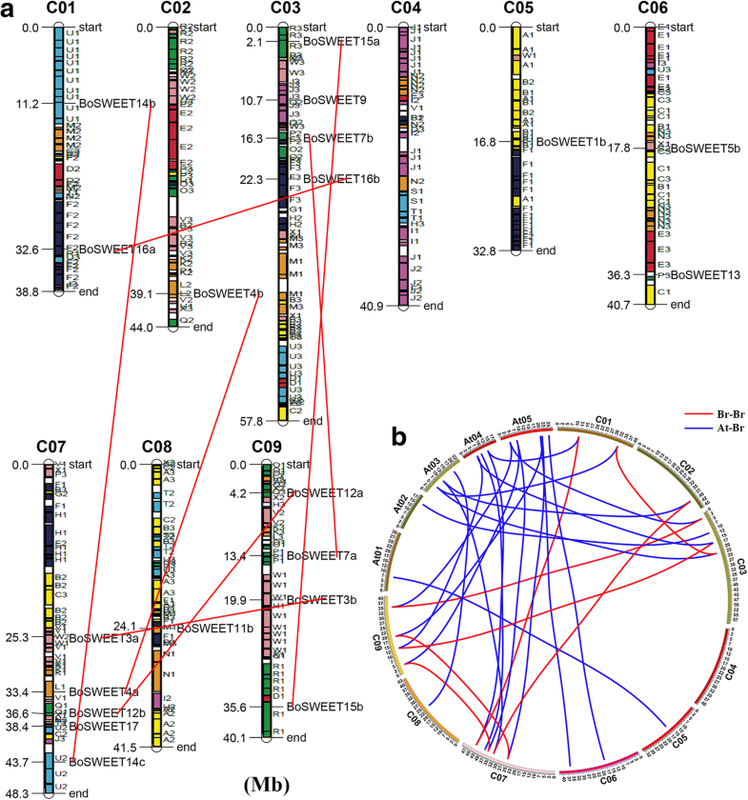 However, there has been no comprehensive analysis of the SWEET family genes in Brassica oleracea (BoSWEET), and the evolutionary pattern, phylogenetic relationship, gene characteristics of BoSWEET genes and their expression patterns under biotic and abiotic stresses remain largely unexplored. A total of 30 BoSWEET genes were identified and divided into four clades in B. oleracea. Phylogenetic analysis of the BoSWEET proteins indicated that clade II formed first, followed by clade I, clade IV and clade III, successively. Clade III, the newest clade, shows signs of rapid expansion. The Ks values of the orthologous SWEET gene pairs between B. oleracea and Arabidopsis thaliana ranged from 0.30 to 0.45, which estimated that B. oleracea diverged from A. thaliana approximately 10 to 15 million years ago. Prediction of transmembrane regions showed that eight BoSWEET proteins contain one characteristic MtN3_slv domain, twenty-one contain two, and one has four. Quantitative reverse transcription-PCR (qRT-PCR) analysis revealed that five BoSWEET genes from clades III and IV exhibited reduced expression levels under chilling stress. Additionally, the expression levels of six BoSWEET genes were up-regulated in roots of a clubroot-susceptible cabbage cultivar (CS-JF1) at 7 days after inoculation with Plasmodiophora brassicae compared with uninoculated plants, indicating that these genes may play important roles in transporting sugars into sink roots associated with P. brassicae colonization in CS-JF1. Subcellular localization analysis of a subset of BoSWEET proteins indicated that they are localized in the plasma membrane. This study provides important insights into the evolution of the SWEET gene family in B. oleracea and other species, and represents the first study to characterize phylogenetic relationship, gene structures and expression patterns of the BoSWEET genes. These findings provide new insights into the complex transcriptional regulation of BoSWEET genes, as well as potential candidate BoSWEET genes that promote sugar transport to enhance chilling tolerance and clubroot disease resistance in cabbage. Sugars as essential energy sources, are synthesized in leaves (source organs) and then translocated via phloem sap into sink organs, such as modified leaves, roots, seeds and fruits, and the amount of sugars influences plant development [1, 2]. In plants, sugar transport is mediated by proteins in the sucrose transporter (SUT) and monosaccharide transporter (MST) and SWEET families [3, 4]. SWEET, a novel class of sugar transporters, is a distinct transporter family which mediates influx or efflux of sugars from phloem parenchyma into the phloem apoplast [5–7]. In prokaryotes SWEET proteins contain only three transmembrane helices (TMHs), while in eukaryotes there are also examples with seven TMHs. The seven-TMHs has evolved with two tandemly repeated three-TMH units separated by a single TMH . Phylogenetic analysis of SWEET proteins has shown that they can be divided into four clades , with clades I and II preferentially transporting hexoses, clade III transporting sucrose, and clade IV being responsible for the flux of fructose across the tonoplast [9–12]. With the rapid development of whole-genome sequencing, genome-wide identification of SWEET genes in various species have been reported, such as in Arabidopsis thaliana , rice (Oryza sativa) , sorghum (Sorghum bicolor) , soybean (Glycine max) , apple (Malus domestica) , grape (Vitis vinifera) , banana (Musa acuminate) , tomato (Solanum lycopersicum)  and rapeseed (Brassica napus) . Biochemical and functional analyses have shown that SWEET genes play significant roles in various physiological processes, such as nectar secretion [21, 22], seed and pollen development [23, 24], leaf senescence , and responses to abiotic [12, 26–28] and biotic stresses [3, 17, 29–31]. For example, AtSWEET8 is essential for pollen viability in A. thaliana, and decreased expression reduces starch content in pollen grains and causes male sterility . Moreover, the SWEET genes are critical for carbon transport regulation in host-pathogen interactions and have been shown to be targets of extracellular pathogens . Induction of SWEET genes upon pathogen infection has also been reported in alfalfa (Medicago sativa), rice, grape, A. thaliana and Chinese cabbage (Brassica rapa) [29–34]. For example, MtN3, the first identified member of the SWEET family, was found to participate in the host-Rhizobium meliloti interaction in alfalfa . OsSWEET11, OsSWEET13 and OsSWEET14 were later shown to be associated with resistance to bacterial blight in rice [29, 31, 33]. In grape, the expression of VvSWEET4 increased after Botrytis cinerea infection . Clubroot disease is a soil-borne disease caused by the obligate biotrophic pathogen P. brassicae and is one of the most devastating diseases in Brassicaceae plants, reducing both crop quality and yields [35, 36]. The life cycle of P. brassicae consists of three stages: the survival stage of resting spores in the soil, the primary infection (root hair infection) stage and the secondary infection (root cortex infection) stage [37–39]. The resting spores can survive in the soil for 6–12 years, making this disease hard to control once the soil has been contaminated . In A. thaliana after P. brassicae infection the expression of AtSWEET15 was strongly induced during gall formation, and the atsweet11 mutant exhibited slower gall formation compared to wild-type plants [30, 34]. In Chinese cabbage, the expression of several BrSWEET genes from Clade I and III increased, as did glucose and fructose levels, in roots of a clubroot-susceptible line compared to a clubroot-resistant line following P. brassicae infection, suggesting a close relationship between P. brassicae growth, sugar translocation and the expression of BrSWEET genes . Cold stress (CS), including chilling (< 20 °C) and freezing (< 0 °C), has a major impact on plant growth and development, limiting geographic distribution and productivity . It has been long established that accumulation of soluble sugars can stabilize cellular components and membranes following CS [42, 43]. Overexpression of AtSWEET4 has been shown to increase plant size and freezing tolerance in A. thaliana , while cold-stressed AtSWEET16 overexpressing lines are unable to accumulate fructose and have increased tolerance to freezing stress . The fructose-specific transporter AtSWEET17 plays a primary role in fructose homeostasis following 1 week of 4 °C treatment . Interestingly, the double mutant atsweet11/atsweet12 was reported to release fewer electrolytes when the temperature was reduced to 4 °C, but exhibited greater freezing tolerance than both single mutants and wild-type A. thaliana . Cabbage (Brassica oleracea var. capitata L.), belonging to the Brassicaceae family, is one of the most economically important leafy vegetable crops worldwide. Chilling and clubroot disease cause severe losses of yields and quality in this species, as well as in other Brassicaceae crops. Even though they have been associated with responses to chilling and clubroot disease in other species, little is known about the role of the SWEET sugar transporters in chilling and clubroot disease responses in cabbage. The objectives of this study were to conduct a genome-wide analysis of the SWEET gene family in B. oleracea and thirteen other species, and to develop a better understanding of the molecular evolution and function of the SWEET proteins in cabbage, while also providing a reference for other Brassicaceae species. The B. oleracea whole-genome sequence used to identify the BoSWEET genes was downloaded from the B. oleracea Genome Database (Bolbase, http://ocri-genomics.org/bolbase/) . The amino acid sequences of the A. thaliana SWEET genes were retrieved from the TAIR database (http://www.arabidopsis.org/). The Brassica rapa whole-genome sequence was obtained from the BRAD database (http://brassicadb.org/brad/) . The Carica papaya, Populus trichocarpa, Vitis vinifera, Oryza sativa, Zea mays, Selaginella moellendorffii, Physcomitrella patens, Chlamydomonas reinhardtii, Volvox carteri, Ostreococcus lucimarinus and Ostreococcus tauri gene information was downloaded from the Plaza v2.5 database (http://bioinformatics.psb.ugent.be/plaza/news/index) . The Hidden Markov Model (HMM) corresponding to the MtN3/saliva (MtN3_slv) domain (PF03083) was retrieved from Pfam 31.0 (http://pfam.xfam.org/) and used to identify putative SWEET proteins with the “trusted cutoff” as the threshold [47, 48]. AtSWEET protein sequences were used as the seed sequences to carry out a BLASTP search in the sequences from the other species with an E-value threshold of 1e− 10. The Pfam 31.0 database, the SMART database (http://smart.embl-heidelberg.de/) and the Conserved Domain Database (http://www.ncbi.nlm.nih.gov/Structure/cdd/wrpsb.cgi/) were then used to further filter and analyze the potential SWEET protein sequences to validate the HMM and BLASTP search results [49, 50]. The SWEET protein sequences from B. oleracea and B. rapa were named by adding a suffix (a, b, c...etc.) based on sequence similarity to the corresponding AtSWEET proteins. The ProtParam tool (https://web.expasy.org/protparam/) was used to analyze the physical and chemical parameters of the BoSWEET proteins, including molecular weight and theoretical pI. The Gene Structure Display Server (GSDS, http://gsds.cbi.pku.edu.cn/index.php) was utilized to draw a schematic diagram of the gene structure according to the genomic sequences and the corresponding coding sequence of each BoSWEET gene . The online MEME tool (http://meme-suite.org/tools/meme) was used to identify conserved protein motifs using default parameters . The TMHs of BoSWEET proteins were predicted by the TMHMM Server v.2.0 (http://www.cbs.dtu.dk/services/TMHMM/). The Conserved Domain Architecture Retrieval Tool (CDART) (http://www.ncbi.nlm.nih.gov/Structure/lexington/lexington.cgi) was used to draw the MtN3_slv domains . The SignalP 4.1 server (http://www.cbs.dtu.dk/services/SignalP/) was used to predict the presence and location of signal peptide cleavage sites in the amino acid sequences. Multiple alignment of all the BoSWEET proteins was performed using ClustalW , and the phylogenetic tree was constructed by MEGA7 with the bootstrap of 1000 replicates using the neighbor-joining (NJ) method . The chromosomal localization of the BoSWEET genes was determined using MapChart 2.30 . OrthoMCL (http://orthomcl.org/orthomcl/) was used to identify the orthologs and paralogs of the SWEET proteins in B. oleracea and A. thaliana. The relationships of orthologs and paralogs were plotted using the Circos software . The occurrence of duplication events and divergence time of orthologous genes, as well as the selective pressure on duplicated genes, was estimated by calculating Ks (synonymous substitution rate) and Ka (nonsynonymous substitution rate) values using DnaSP 6 . The Ks values of all the syntenic orthologs of the SWEET genes between B. oleracea and A. thaliana were then plotted as the density using an R package . The divergence time was calculated using the formula, T = Ks/2r, with the value of r being 1.5 × 10− 8 synonymous substitutions per site per year for dicotyledonous plants . To investigate BoSWEET expression profiles in response to chilling stress, the advanced inbred cold-tolerance cabbage line 923 (CT-923) was used. Seeds were grown in sterilized soil in a growth chamber at 25 °C day /18 °C night, with a photoperiod of 14 h light/10 h dark. After 4 weeks, to induce chilling stress, the seedlings were maintained at 4 °C for 0, 3, 6, 12, 24 and 48 h. Next, samples were collected and immediately frozen in liquid nitrogen and stored at − 80 °C till RNA extraction. For quantitative gene expression analysis, total RNA was extracted using the TaKaRa MiniBEST Plant RNA Extraction Kit according to the manufacturer’s instructions (Takara Bio Inc., Dalian, China). The first-strand cDNA was synthesized using the PrimeScript™ RT reagent Kit with gDNA Eraser (TakaRa). The qRT-PCR reactions were performed using TB Green™ Premix Ex Taq™ II (TakaRa) and carried out on a Roche LightCycler® 480II PCR System. Gene specific primers were designed using Beacon Designer 7.7 (Premier Biosoft, CA, USA) and are listed in Additional file 1: Table S1. BoActin2 was used as the reference gene . All reactions were performed in triplicate, and the 2-△△CT method was applied to calculate the relative expression . Duncan’s multiple range test at P < 0.05 was used to determine the significance level of the data, using the SPSS 21 software (SPSS Inc., USA). To analyze the BoSWEET expression profiles in different organs and in response to P. brassicae infection, RNA-Seq data from the GSE42891 (GEO database) and PRJNA453960 (BioProject accession) were downloaded from NCBI. The GSE42891 RNA-Seq data contained expression profiles of seven different organs/tissues (bud, callus, flower, leaf, root, silique and stem) of the cabbage homozygous line 02–12 . The PRJNA453960 RNA-Seq data contained the root expression profiles from clubroot-resistant cabbage Xiangan336 (CR-XG336) and clubroot-susceptible cabbage Jingfeng No.1 (CS-JF1) at 7 (primary infection stage) and 28 (clubroot formation stage) days after inoculation (DAI) with P. brassicae. The corresponding root samples at 7 d and 28 d without inoculation were sampled as the mock control, and all the samples were collected in three biological replicates. Raw RNA-Seq reads were processed to trim the adapter and low-quality sequences using Trimmomatic . The high-quality cleaned reads were aligned to the B. oleracea genome using HISAT  allowing up to 3 edit distances. Following alignments, raw counts for each gene were derived and normalized into FPKM (fragments per kilobase of exon model per million mapped reads). Raw count data was then fed to DESeq2  to identify differentially expressed genes with a cut off of fold change > 2 and FDR < 0.05. Heatmap of BoSWEET gene expression profiles was generated using the pheatmap package (https://cran.r-project.org/web/packages/pheatmap/) based on the log2 transformed FPKM values. 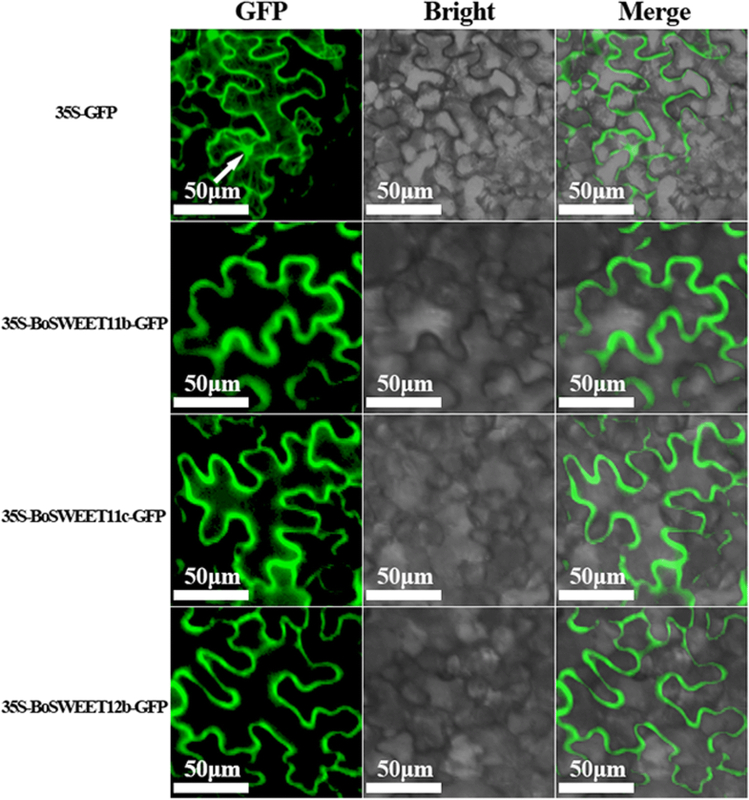 To investigate the subcellular localization of the BoSWEET proteins, they were transiently expressed as translational GFP (green fluorescent protein) fusion proteins in tobacco (Nicotiana benthamiana) leaf epidermal cells. The full-length coding sequences of BoSWEET11b, BoSWEET11c and BoSWEET12b were amplified using a forward primer containing a Kpn I restriction site and a reverse primer containing a Xba I restriction site. The primers used are listed in Additional file 1: Table S1. The amplification products were digested with Kpn I and Xba I and ligated into the pCAMBIA1300-35S-GFP (35S-GFP) vector. The recombined plasmids were then transformed into Agrobacterium tumefaciens strain GV3101 . Agrobacterium transient expression and infiltration was carried out according to previously published protocols . Leaves transformed with the 35S-GFP vector alone were used as controls. Two days after infiltration, fluorescence and bright-light images of transiently infected tobacco leaves were obtained using a fluorescence microscope (BX41, Olympus, Rungis, France). All putative SWEET genes were identified in B. oleracea and thirteen other representative plant species (Additional file 2: Table S2). A phylogenetic tree of the identified 205 SWEET genes from the 14 species was constructed in order to investigate the evolutionary history of the family in the plant kingdom, with genes from the four algal species selected as the outgroups (Fig. 1, Additional file 2: Table S2). All other genes in the tree were clustered into four clades (clade I, clade II, clade III and clade IV) that were named according to the previously reported A. thaliana nomenclature . According to the evolutionary distance with the outgroups, clade II formed first, followed by clade I, clade IV and clade III, with the latter expanding most rapidly (Fig. 1). The 30 BoSWEET and 33 BrSWEET genes identified in this study were named sequentially from BoSWEET1 to BoSWEET17 and BrSWEET1 to BrSWEET17, respectively, according to their A. thaliana homologs. The phylogenetic relationships between the genes in the four clades were investigated (Fig. 2). In total of 14 plant species included dicotyledonous species (B. oleracea, B. rapa, A. thaliana, Carica papaya, P. trichocarpa and V. vinifera), monocotyledonous species (O. sativa and Z. mays), a pteridophyte (S. moellendorffii), a bryophyte (P. patens) and algae (C. reinhardtii, V. carteri, O. lucimarinus and O. tauri). In an evolutionary context, examples of genes in Clade II were first observed in the four algal species (unicellular chlorophyta), which contained fewer SWEET members (1–3), and clade I and clade IV were predominantly observed in P. patens (bryophyte) and S. moellendorffii (pteridophyta), respectively. Clade III was first formed in monocots. In eudicots, all six selected species underwent the γ triplication event, and the larger number of SWEET genes in P. trichocarpa than in C. papaya and V. vinifera is likely due to the salicoid-specific genome duplication . As consequence of the α and β duplication events that occurred after the divergence of Brassicales, A. thaliana also has more members than C. papaya. Finally, the number of SWEET genes in B. oleracea and B. rapa apparently doubled after the Brassica-specific whole-genome triplication (WGT) event, based on a comparison with A. thaliana . We constructed an unrooted phylogenetic tree (Additional file 3: Figure S1) of SWEET proteins in B. oleracea, B. rapa and A. thaliana. A total of 80 members clustered into four clades, containing 16, 21, 34, and 9 members, respectively. Based on the tree, eleven duplication clusters in B. oleracea were identified and are listed in Table 1. Note: tPCK Chr Chromosome of translocation Proto-Calepineae Karyotype, ancestral genome of Brassica species, CCB conserved collinear block, LF the least fractionated blocks of Brassica, MF1 the medium fractionated blocks of Brassica, MF2 the most fractionated blocks of Brassica, PL protein length, MW molecular weight. The physical and chemical characteristics of the SWEET proteins in B. oleracea were predicted, and their sizes were found to range from 147 aa (BoSWEET7b) to 475 aa (BoSWEET5c), with the corresponding open reading frames (ORF) ranging from 441 bp to 1425 bp. The predicted molecular weights ranged from 16.20 kDa (BoSWEET7b) to 53.51 kDa (BoSWEET5c) (Table 1), and the theoretical isoelectric points (pI) from 6.28 (BoSWEET15b) to 9.56 (BoSWEET7a), with most, except for three, being higher than 7.60 (Table 1). The three subgenomes of B. oleracea (LF, the least fractionated blocks of Brassica; MF1, the most fractionated blocks of Brassica; MF2, the medium fractionated blocks of Brassica) have been established to distinguish the degree of fractionation in genome evolution . In this study, 29 BoSWEET genes (i.e., the whole family except BoSWEET13) were distributed among the three subgenomes (11 BoSWEET genes in LF, 9 in MF1, and 9 in MF2) (Table 1). Interestingly, all the BoSWEET genes were retained in B. oleracea after triplication and fractionation, except for the loss of BoSWEET6. Approximately half of the BoSWEET genes (8/17) were retained in two copies, while only five (BoSWEET8, − 9, − 10, − 13 and − 17) and three (BoSWEET5, BoSWEET11 and BoSWEET14) were retained in one and three copies, respectively (Table 1). The retained copies have the same conserved collinear block. The physical positions of the BoSWEET genes on the B. oleracea chromosomes were identified (Fig. 3a), which revealed that 20 (66.7%) were distributed across the nine chromosomes (C01-C09), with the exception of the C04 chromosome having no members, while the largest number on any single chromosome was five on chromosome 7 (Fig. 3a). Ten SWEET genes (BoSWEET1a, −2a, −2b, −5a, −5c, − 8, − 10, −11a, −11c and -14a) were not anchored on any of the B. oleracea chromosomes. In eukaryotic genomes, a substantial proportion of protein-coding genes belong to multigene families, which have presumably evolved by the process of gene duplication. Duplicated genes from eukaryotic genomes have originated predominantly from inter-chromosomal duplications . We observed that seven BoSWEET genes underwent segment duplication (7 duplications), leading to many homologs on different chromosomes, as indicated with red lines in Fig. 3a. To further highlight the specific retention of BoSWEET genes, their syntenic relationship with AtSWEET genes was determined using the Circos program (Fig. 3b). The Ks and Ka values of 30 syntenic SWEET orthologous pairs between B. oleracea and A. thaliana were analyzed (Table 2, Additional file 4: Table S3). The Ka/Ks ratios of all the SWEET syntenic orthologous pairs were far less than 1, indicative of purifying selection for retention. To estimate the divergence time between the two species, the Ks values of the orthologous SWEET genes were used and observed to range from 0.3 to 0.45, concentrating at approximately 0.35 (Fig. 4). According to the neutral substitution rate of 1.5 × 10− 8 substitutions per site per year for dicotyledonous plants , this suggests the SWEET gene family of B. oleracea diverged from A. thaliana approximately 10 to 15 million years ago (MYA). We concluded that the SWEET genes diverged concurrently with the Brassica-specific WGT event that occurred approximately 13–17 MYA [45, 70]. Gene structural diversity and conserved protein motif divergence played key roles in the evolution of the SWEET gene family . The exon-intron organization of the cabbage SWEET genes was analyzed, and half (15 members) were found to have six exons, while seven members had four exons, three had five exons, three had three exons and BoSWEET7b and BoSWEET5c had 2 and 11 exons (Fig. 5), respectively. The exon lengths were similar, while the intron length varied, with eight BoSWEETs (BoSWEET3b, −5b, − 5c, − 9, −11a, −11b, −11c and − 17) containing very long introns (Fig. 5). Six genes appeared to have exon-intron loss variations. For example, BoSWEET2b (four exons) lost the first two exons and two introns compared with BoSWEET2a; BoSWEET5a (four exons) lost the first exon and intron compared with BoSWEET5b; BoSWEET11a (three exons) lost the first three exons and introns compared with BoSWEET11b; and BoSWEET14c lost the third exon compared with BoSWEET14b (Additional file 5: Figure S2). Among the 30 BoSWEET proteins, we found that the most BoSWEET (21) contained two MtN3_slv domains, a characteristic eukaryote SWEET protein domain, whereas eight contained only one MtN3_slv domain (Table 1). The number of TMHs ranged from three to eleven and concentrated in seven (Additional file 6: Figure S3). However, we identified the BoSWEET5c protein with four MtN3_slv domains that has a similar predicted protein architecture to VV14G09070 from V. vinifera, and that together constitute a novel sub-type, which were named extra-SWEET (Additional file 7: Figure S4). To further investigate the structural diversity, the conserved motif structure of all the BoSWEET proteins was analyzed. In total, ten conserved motifs (motifs 1–10) were identified, among which motifs 7, 2, 4, and motifs 1, 6, 3 were annotated as MtN3_slv domains, respectively. Motif 5 or motifs 9, 5 connects the two MtN3_slv domains (Fig. 5). In addition, none of the 30 BoSWEET proteins were predicted to contain signal peptide sequences. A total of eight BoSWEET genes were selected for expression pattern analysis using the chilling-tolerant line CT-923. The eight selected BoSWEET genes represented all four clades, with BoSWEET2b and BoSWEET4a belonging to clade I and clade II, respectively; BoSWEET11b, BoSWEET11c, BoSWEET12b and BoSWEET15b belonging to clade III, and BoSWEET16a and BoSWEET17 belonging to clade IV. We found that expression of BoSWEET2b, BoSWEET4a and BoSWEET15b were induced after chilling stress (Fig. 6), with BoSWEET2b expression increasing to maximal levels at 6 h following chilling stress. BoSWEET4a and BoSWEET15b expression peaked at 24 h after chilling stress. In addition, while the expression of BoSWEET11b, BoSWEET11c, BoSWEET12b, BoSWEET16a and BoSWEET17 decreased in response to chilling, the expression patterns were different. The expression of BoSWEET11b and BoSWEET12b declined to a minimum at 12 h, then rose to reach nearly half of the expression of the control. The expression of BoSWEET11c declined sharply to a minimum at 3 h after treatment, then increased to a maximum at 48 h. BoSWEET16a and BoSWEET17 had a similar expression pattern after chilling exposure, with expression declining rapidly and remaining at a low level even after 12 h (Fig. 6). We examined the RNA-Seq data set (GSE42891) to determine transcript levels of the BoSWEET genes in the cabbage bud, callus, flower, leaf, root, silique and stem. The expression of most of the BoSWEET genes exhibited different patterns (Fig. 7a). Seven were expressed in all organs, whereas the expression of three was not detected. Several genes were expressed in only one or two organ types, such as BoSWEET3a in buds, BoSWEET3b and BoSWEET5c in buds and flowers, BoSWEET14c in roots and stems, and BoSWEET16a in calli and roots (Fig. 7a). This diversity of expression patterns suggested a broad range of biological functions of BoSWEET genes during growth and development of cabbage. We also examined the expression patterns of BoSWEET genes in CR-XG336, a clubroot-resistant line, and CS-JF1, a clubroot-susceptible line, infected by P. brassicae at two infection stages, and observed variation between the two different cultivars and at different infection stages (Fig. 7b). Several genes were nearly undetectable in both cultivars both before P. brassicae infection and at two infection stages. Six (BoSWEET4a, −11c, −12a, −12b, −14b and -15b) and three (BoSWEET14c, BoSWEET16a and BoSWEET17) BoSWEET genes were significantly up- and down-regulated, respectively, in CS-JF1 at 7 DAI (primary infection stage) compared with mock-treated plants. No BoSWEET genes were significantly up- or down-regulated in CR-XG336 at 7 DAI compared with mock-treated plants (Fig. 7b, Additional file 8: Table S4). Moreover, at 28 DAI (clubroot formation stage), six BoSWEET genes (BoSWEET12b, − 13, −14a, −14b, −14c and − 17) were significantly down-regulated in CS-JF1 after infection, whereas two (BoSWEET1a and BoSWEET16a) and three (BoSWEET13, BoSWEET14a and BoSWEET14b) were up- and down-regulated in CR-XG336, respectively (Fig. 7b, Additional file 8: Table S4). To study the subcellular localization of BoSWEET proteins, BoSWEET11b, BoSWEET11c and BoSWEET12b were heterologously and transiently expressed in tobacco leaf epidermal cells as translational GFP fusion proteins. All three proteins were found to be localized to the plasma membrane (PM), whereas the control 35S-GFP (GFP alone) was detected in the PM, cytoplasm and nucleus (Fig. 8). These results suggested that all three proteins are PM-localized (Fig. 5, Additional file 5: Figure S2). Gene family evolution is characterized by gene duplication via whole-genome duplication (WGD), tandem gene duplication and segmental duplication events . Following duplication, duplicated gene pairs can undergo different fates, including neo-functionalization (functional diversification), sub-functionalization (partitioning of the function between daughter copies) and non-functionalization [73, 74]. In plants, genome duplication has been shown to contributed their ability to adapt to diverse environments, including drought, pathogen attack, and extreme temperatures, as well as reproductive development . In this study, the number of SWEET genes was found to vary considerably among fourteen plant species. For example, there were only 1–3 members in algae, with the salt water species O. lucimarius and O. tauri having only one copy and the fresh water species V. carteri and C. reinhardtii having three. The evolution from unicellular (algae) to multicellular plants led to further expansion of the SWEET gene family. The bryophyte P. patens is an early diverging land plant with only one primitive protophloem and has six SWEET gene family members, while the pteridophyta S. moellendorffii evolved to have phloem and has 15 SWEET genes, which is similar to the number in many angiosperms (Fig. 2). These results suggested that the expansion of SWEET genes might play an important role in land plant adaptations to terrestrial conditions. Among Brassicaceae species, B. oleracea, B. rapa and A. thaliana have experienced γ, β and α WGD events. The number of SWEET genes in B. oleracea (30) and B. rapa (33) nearly doubled when compared with the number in A. thaliana (17) after the Brassica-specific WGT event, during which genes had experienced triplication, differentiation and fractionation (loss) [45, 70]. However, the gene balance hypothesis assumes that genes participate in macromolecular complexes, signaling and transcriptional networks are preferentially retained, thus avoiding the instability and unfitness of network caused by the imbalance associated with loss of one member of a complex [76–78]. Similarly, we found evidence of SWEET gene fractionation in B. oleracea after the split with A. thaliana from the recent common ancestor, with BoSWEET6 being lost, five BoSWEETs (BoSWEET8, − 9, − 10, − 13 and − 17) and eight BoSWEETs (BoSWEET1, − 2, − 3, − 4, − 7, − 12, − 15, − 16) having one and two separate orthologous genes in A. thaliana, respectively (Table 1; Additional file 3: Figure S1). WGD or WGT generates the multiplicity in gene copy numbers, and is the main source of genetic redundancy. We firmly believe that changes in SWEET genes during the WGT event played critical roles in the adaptation and expansion of rich morphotypes of Brassica crops. The SWEET proteins have evolved from an internal repeat duplication of three-TMH unit and fusion with an insertion of TMH4 . In this study, we searched for ten conserved motifs among the 30 BoSWEET proteins and found the MtN3_slv domains were located in duplication regions in almost all BoSWEET proteins (Fig. 5). The extra-SWEET protein (BoSWEET5c, 11-TMHs) may have originated from two internal SWEET (7-TMHs, two MtN3_slv domains) duplications, similar to the duplication of semi-SWEET (3-TMHs, one MtN3_slv domain) and subsequently evolved into the SWEET [8, 79]. In V. vinifera, berries accumulate high levels of sugars, and the SWEET protein, VV14G09070, might play a role in mediating elevated levels of sucrose transport. To this end, it would be very interesting to investigate the spatial expression pattern of VV14G09070 and its potential function in long distance sugar transport during flower or berry development . Transcriptome sequencing revealed that more BoSWEET genes were highly expressed in flowers and buds than in the other organs investigated. Of the highly expressed BoSWEET genes, most were in clade III (Fig. 7a), which is consistent with studies of rapeseed (Brassica napus) . The expression of SWEET genes has been shown to change in response to abiotic stress in several plant species [19, 26, 81]. For example, in tomato SlSWEET10a, −10b, −10c, −11a, −11b, −11c, −11d, −12a and -12c were reported to have similar expression patterns and were up-regulated several fold in leaves but substantially down-regulated in roots in response to sugar treatment, and salt, heat and cold stresses . We observed that the expression of BoSWEET11b, −11c, −12b, −16a and − 17 was down-regulated by chilling stress (Fig. 6), which may contribute to the accumulation of glucose and fructose in leaves, leading to increased chilling tolerance. Heterologously expressed BoSWEET11b, BoSWEET11c and BoSWEET12b proteins fused to a GFP marker were observed to be accumulated in the PM, consistent with a role in mediating sucrose efflux from phloem parenchyma cells into the sieve element-companion cell complex . The expression of BoSWEET16a and BoSWEET17 declined rapidly after chilling stress and remained at low levels from 12 h to 48 h. The orthologous genes from A. thaliana, AtSWEET16 and AtSWEET17, have been reported to export fructose from the vacuole and contribute to cytosolic fructose homeostasis [11, 12, 26]. Previous studies revealed that P. brassicae obtains sugars from hosts to complete its life cycle, involving the formation of galls, which act as an additional sink. In A. thaliana, it was found that sucrose accumulated in uninfected leaves, but not in P. brassicae infected leaves because sucrose was exported from leaves into the clubroot galls . The expression of sugar transporter genes may therefore influence plant-P. brassicae interactions. 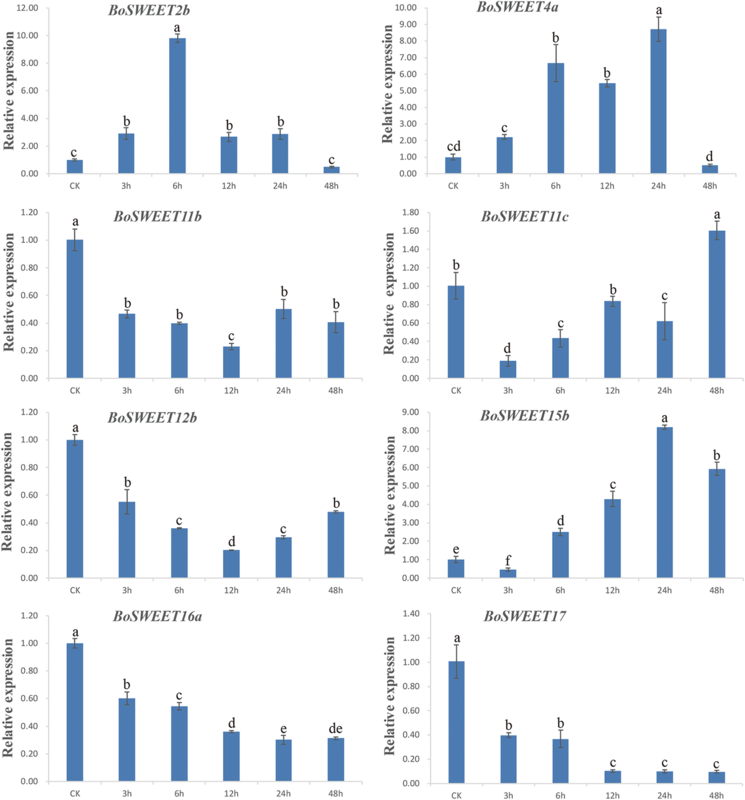 In this study, the expression of six BoSWEET genes (BoSWEET4a, −11c, −12a, −12b, −14b and -15b) was up-regulated in roots in the susceptible CS-JF1 upon P. brassicae infection at 7 DAI compared with mock plants. In contrast, no BoSWEET genes were up-regulated in the resistant CR-XG336 at 7 DAI (Fig. 6; Additional file 8: Table S4). We infer from these results that these six BoSWEET genes could be responsible for transporting sugars to the sink roots associated with P. brassicae colonization in CS-JF1. Clade III SWEET proteins have been shown to function as sucrose transporters involved in long distance sugar transport in A. thaliana [3, 9], consistent with our observation that all the up-regulated BoSWEET genes involved in P. brassicae infection in CS-JF1, except BoSWEET4a, belong to clade III. Clade III SWEET proteins have also been shown to be involved in sugar transport in clubroot disease establishment . We also noted that the expression of the BoSWEET1a and BoSWEET16a genes was approximately 4-fold and 2-fold higher, respectively, in CR-XG336 at 28 DAI than in the uninfected control (Additional file 8: Table S4). Whether the increased expressions of the two BoSWEET genes contribute to CR-XG336 resistance to P. brassicae infection stress remains to be established. 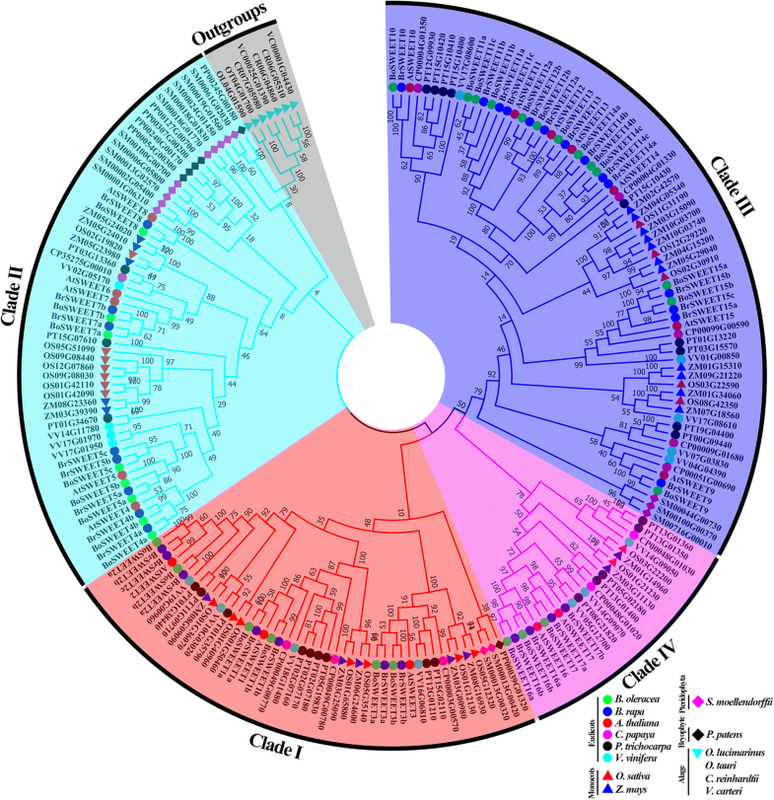 In this study, 30 BoSWEET genes were identified in the B. oleracea genome and further clustered into four clades based on a phylogenetic tree of 205 SWEET homologs from fourteen representative plant species. Clade II was evolutionarily the most ancient, while clade I, clade IV and clade III were formed successively. The ORF lengths of the BoSWEET genes ranged from 441 bp to 1425 bp, and the Ks values of the orthologous SWEET genes from B. oleracea and A. thaliana ranged from 0.30 to 0.45, meaning that the estimated time of divergence of the two species was approximately 10 to 15 MYA. Eight BoSWEET proteins were predicted to contain a single MtN3_slv domain, twenty-one to contain two, and one (BoSWEET5c) to have four. qRT-PCR analysis showed that the expression of five BoSWEET genes decreased when plants were exposed to chilling stress. The expression of six BoSWEET genes was up-regulated in CS-JF1 following P. brassicae infection at 7 DAI compared with mock controls, and we hypothesize that they might be responsible for transporting sugars to the sink roots during P. brassicae colonization. Overall, these findings facilitate unraveling the potential candidate BoSWEET genes involved in the response to chilling and clubroot disease, and provide valuable information to facilitate the breeding of chilling tolerant and clubroot disease-resistant cultivars in cabbage. The authors gratefully acknowledge Dr. Liang Xu of Nanjing Agricultural University for his helpful advice and critical reading of the manuscript. This work was in part supported by the China Postdoctoral Science Foundation funded project (2017 M621669), National Key Research and Development Program of China (2016YFD0101702), National Natural Science Foundation of China (31701773), Key Research and Development Program of Jiangsu Province (BE2017379), Jiangsu Agriculture Science and Technology Innovation Fund (CX(18)2006) and National Modern Agriculture Industry Technology System (CARS-25). The funding body played no role in study design and data collection, analysis, interpretation of data and in writing the manuscript. Plant materials are available under request to the respective owner institutions. The datasets supporting the results of this article are included within the article and its additional files. JL and ZF conceived the and supervised the work. WZ did bioinformatics analyses and drafted the manuscript. FY, LY and HW performed validation of experiments. SW and XS performed the qRT-PCR analysis. KB and JT processed the transcriptome data. All authors read and approved the final manuscript.